KLC Physical Therapists (PTs) work to assist all students in accessing their educational program and navigating the physical environment at school and within the community. Their goal is to help students reach their maximum level of independence in all environments. PT services will initially be focused on achieving developmental milestones and then the focus shifts to encouraging independence within the school environment as well as in the community at jobsites. 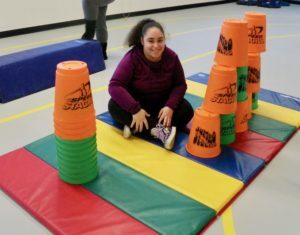 The PT plays a more active role in the student’s ability to access the wide variety of community-based settings that ensure a successful transition to their adult lives. Services are integrated into the classrooms, jobsites and the community and may include individual, small group or integrated services. Consultation with the family and coordination with community-based health care providers is important for creating strategies that facilitate participation at the highest possible level. The PT is critical to facilitating each student’s active involvement throughout the school environment and works with the entire team to set realistic goals and expectations for the student ensuring that the student is appropriately challenged. They instruct all staff members in safe lifting techniques, proper guarding of students during mobility and the use of specialized equipment (i.e. walkers, standers and wheelchairs). When appropriate, the PT communicates with community-based vendors, assists the family in purchasing equipment and coordinates appointments for repair of all equipment.